Tagged under CLAMP, TMS Entertainment, Series. Three junior high schools have a field trip to Tokyo Tower, and a girl from each school is chosen. Hikaru Shidou, Umi Ryuzaki, and Fuu Hououji are transported to a magical world called Cephiro. Soon after arriving, they are greeted by Master Mage Clef, who bestowed protective armor and magical powers upon the girls. They have been chosen to become Legendary Magic Knights. To return to their own world, these girls must seek out and awaken the three legendary Rune Gods and rescue Princess Emeraude from the evil high priest Zagato. What will be the fate of the Knights and Cephiro? 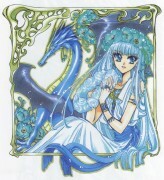 Rayearth is a wonderful manga for fans of the shoujo and fantasy genres. Yet, unlike many shoujo stories, Rayearth is more about action than romance, so it's a great story when you're tired of hearing "Tamahome... Miaka..." for the 9572nd time. Its short length, especially as the series is split into two distinct story arcs, makes it a quick read without needed a lot of commitment of time and money. The story mostly benefits from this short length as there is no room for long filler that stretches your patience. It is an appealing story with the classic Heros' Quest premise, with the classic CLAMP dark twists, set in the beautiful, lush environment of Cephiro. This is another magical girl anime. I always know this anime ever since I was a child and though I had no plan of watching it again I did because of the fact that it's from CLAMP and I love CLAMP and their works. When I watched it again, it really fun to get that fondness over an anime you last felt around 9 or 10 years ago. I love the passion of the Magic Knights they depicted here just to save Cephiro and its people. I also love the costumes of the cast despite they have round gems all over them. I love how cast value their relationship to one another. Though it's much of a romantic anime but I guess it's a beautiful anime about soul-searching and discovering the power within us. Another anime that I love. One of the first that I've watched, I had to wake up 7:00 on a saturday to watch it (torture!! ), but it was totally worth it. Used to love the relationship between Fuu and Ferio. All the characters are great in this anime, but it's CLAMP so it's to be expected. I own the series in official VHS, but it was a compilation of the first episodes in three tapes. Also own all of the manga. MKR is one of my many childhood anime series, and until now I can't stop adoring the three Magic Knights; their beauty is just so effervescent. They've brought some light about girls being able to handle and work alongside Mecha. Overall, I really liked the story and I was left wanting for more action and yes, romance! First and Second season are good. It's and old anime so the animation and sound aren't excellent, but the opening song is fantastic, at least in Spanish. This anime brings me good memories from kid. By today's standards, the series may seem lackluster and just a little on the outdated side, but it is still a wonderful anime. 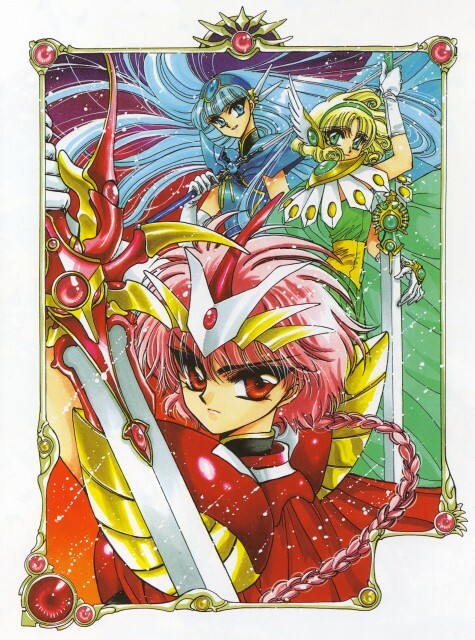 Magic Knight Rayearth was actually the second series I saw in full, and while it isn't my favorite CLAMP series, its still a piece of my childhood. While the graphics and music may not be up to par with some of today's newer anime's, they will always hold a special place in my heart. Just finished seeing the entire series. This is the only other anime (besides "Neon Genesis Evangelion") that I believe exceeds my expectations in all it's attributes (animation, artwork, music, storyline, plot, etc) and always tends to blow you away even more every single time you watch it. Definitely one of my all-time favourites. UMI ROCKS!!! An oldie but goodie. I've read the whole manga, but I'm only halfway through the anime. (I'm interested to see how the storyline differs between the two.) 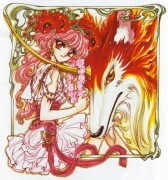 CLAMP's old-school style is in full force here!